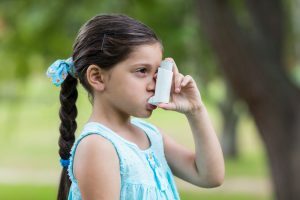 Wheezing in Small Children: Alternative to Inhalers! When daycare-age children get a cold, they often have wheezing — even usually! Parents then tend to go on the internet and begin equating “wheezing” with “asthma,” which can sometimes be serious and lead to emphysema late in life. Parental panic often ensues, and the child is taken to an emergency room. Albuterol and often steroid inhalers are prescribed because doctors don’t know the patient. To clarify, “wheezing” is a sound, and “asthma” is a diagnosis. Not all wheezing is asthma. Especially when wheezing accompanies a cold — in children between 1 and 5 years of age — the sound happens when breathing whistles around mucous plugs which accumulate during a cold. 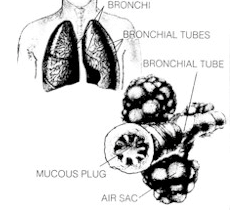 It is not a matter of actual constriction of the bronchial tubes. A very important aspect of wheezing in small children is psychological. Little children are very tuned into their parents’ emotions — actually even psychic! When parents get anxious, kids get anxious. Then they tend to breathe in rapid shallow breaths, like a bird. Unfortunately, these breaths are too shallow to help them cough out the mucous plug! This rapid breathing panics the parents more, particularly when they read on the internet about abdominal retractions in small children when they are breathing heavily. Parents believe a very serious event is happening, so they panic more, and the vicious cycle goes round and round. Ironically, the decision to go to the ER gives the parents something to do. They relax, and the child calms down. Going out in the open air often helps the child cough out the mucous plugs. By the time they get to the ER, the wheezing is already much better! Nevertheless, doctors feel compelled to prescribe something, so they give an epinephrine inhaler and/or steroid inhaler. Of course, albuterol is an analogue of adrenaline, so it increases heart rate and symptoms of anxiety. These are hard to understand by small children, so they feel anxious. And the cycle continues! Obviously, the goal is to help the child to cough out the mucous plugs. This can be done very easily. First, though, parents have to calm down! Taking a moment to slow down, slow breathing, meditate a bit, have a glass of wine — whatever works — helps the child to slow breathing as well. He or she gets the idea that nothing serious is happening. Then, take the child into the bathroom while the shower is turned on full hot and the door is closed. This steams up the room. Tiny droplets of steam get into the lungs and moisten up the mucous plugs. Hopefully the child has a few coughing fits, which clears of the wheezing. Do this for about 20 minutes or so. To help even more, the mother (or father) can hold the child on her lap and give a simple massage. 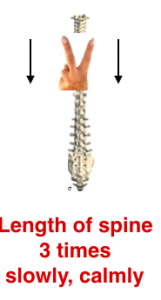 While being calm and breathing very slowly, take two fingers and move them slowly and firmly down along each side of the spine, starting from the very top and going to the very bottom. Do this three times or so. The purpose of this massage is that it helps break up tightness in the chest, allowing the child to take deeper breaths, which help to cough out the mucous plugs. After 20 minutes of steaming and massage, if wheezing still persists, take the child for a brief walk outside in the colder air. This usually causes a sudden enough chest contraction that the mucous plugs are coughed out readily. Finally, one more thing can be tried if all else fails — chest percussion. Just pound the chest as if it is a drum — not violently, but firmly enough to get a resonant sound out of the chest. This helps to dislodge mucous plugs and enable better coughing. 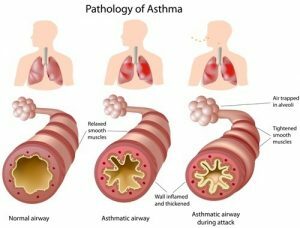 How do you know if it is asthma? Basically, if there is a cold (runny nose, stuffy nose, sneezing, sore throat, or even fever), the problem is from mucous plugging. If wheezing happens when there is no cold, or during allergy season, or during vigorous exertion, wheezing might be due to asthma. This is not due to mucous plugs. It is caused by bronchial constriction — a narrowing of the bronchial tubes. Such a situation will not respond to steaming, of course, so inhalers are appropriate. Readers of this blog understand that such treatment is likely to be suppressive rather than curative. Nevertheless, there is a place for it in a crisis. For cure, the best recommendation is to visit a classical homeopath or acunpuncturist. [Don’t forget. You can use this site to treat acute wheezing attacks. The module to use is cough. For other problems, there are many other modules. Once you get to the module you need, you answer some questions. The algorithm uses the answers to choose an appropriate eRemedy. You then play the eRemedy DIRECTLY on your cellphone or computer according to the recommended protocol. This usually brings rapid relief within minutes or a few hours! Thanks for the clarification. It is true, understanding the disease is very important, because it prevents people from inadequate and ineffective treatments and excessive stress.